MANILA, Philippines - The full list of topnotchers or top 10 passers for November 2017 Midwife board exam is available on this page as officially released on Wednesday, November 8, 2017 or in three (3) working days after the last day of exam. 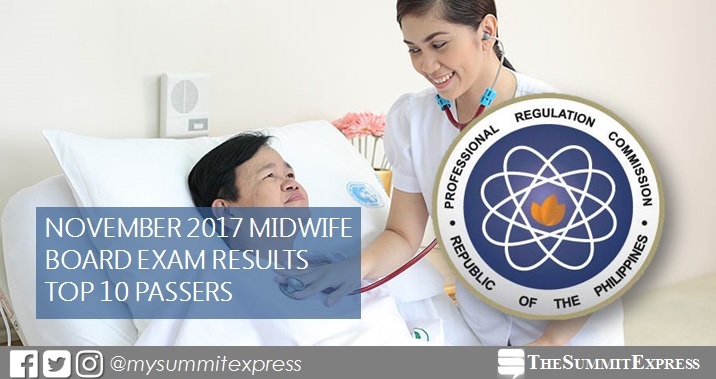 The Professional Regulation Commission (PRC) conducted the Midwife licensure exam in the cities of Manila, All Regional Offices and Zamboanga on November 4 and 5, 2017. In the November 2016 Midwife board exams, Maribel Doroja Sabenia from Estenias Science Foundation School - Casiguran, Sorsogon topped the board with 90.10%. It was followed by Jona Rose Carolino dela Rosa of Great Plebeian College garnering 89.30%. In the November 2015 exams, Arianne Mae Soriao Abella from Catanduanes State University (CSU) - Virac and Emarie Legson Villare of Speed Computer College - Magsaysay, Sorsogon City tied on the top spot with 88.10%. Pines City College alumna Abigail Pascual Libag placed second with 87.85%.